YAY THE CIRCUS!!!!!!!!! some goodies for you all. Come on let's all run aways and join the circus when we can eat cotton candy and has elephants and lions for pets.... Ahhh even the giraffes! YAY! 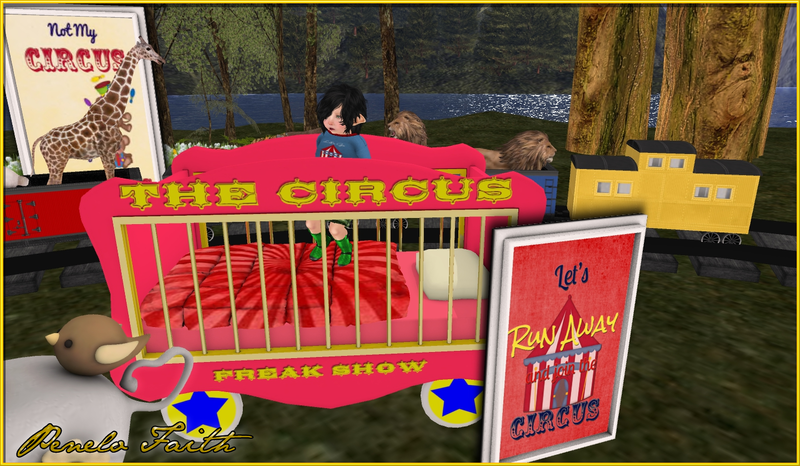 There is a new events for the Toddleedoo of SL. So you need to check this out! Circus afro, circus afro... polka dot polka dot polka dot afro! Yes yes polka dots on my tights! Which are a freee group gift that you needs in your liveeeeesssss. Enough chitter chats let's join the Circus Afro!!! Come on you knows you wants to :3 weeeeeeeeeeee~! Watch the awesome video below to jams with me~! He will be posting soon, so just keep your eyes open! Buglets circus tents have 10 commons and 2 rares. They are adorable and have a few solo sit animations from it my favorite is probably the upside down monkey! hehe. It was so fun setting up for this post. The train in the backgroup there are actually carts you can sit in!. Some even have multiple sits. woo!